Some of the main features lay under the hood and might not seem to be obvious at first glance. One of the most underestimated - although one of the most powerful features - is the apps-file. With this file it is possible to set application-specific parameters for dimension, decoration, default workspace to open on, stickyness and much more. It will let you manipulate almost every setting for any window or application. The best way to learn about it is to visit the wiki-site for the apps-file. The keys-file does not only provide comfort to people who have no mouse, it also makes working more comfortable for all users. Setting up a proper keys-file lets you control almost everything and is a lot faster than from using a menu with only keys, key.combinations and key-chains. People who do not like to raise their hands from the keyboard to grab the mouse and people who do not let lose their rodent will love the keys-file for being fully customizable to one's needs and workflow. Learn more about the keys-file in the wiki. Tabbing is a nice feature that allows you to tab windows together. This can be combined with the "autogrouping" feature that is provided via the apps-file. This will make certain applications tab together by default. 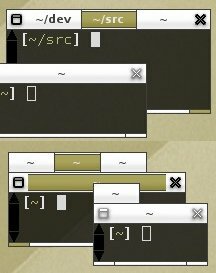 Tabs can eiher be embedded into the window's titlebar as shown in the upper screenshot or they can appear as little tabs at the outside of a window such as the lower example. The position and size of the outside-tabs is customizable. The Slit is often confused with the toolbar. The slit is a dock for any application that can be 'dockable'. A docked application is anchored and appears on every workspace. It cannot be moved freely and is not influenced by any manipulation to windows. Typical programs that go into the slit are dockapps or gkrellm. The latter one is shown in the litte example shot. The Root-Menu is the menu that appears on a right click on the desktop. It is fully customizable and implies a lot of native features such as a configure-menu, a style-menu, and many custom menus can be used and included. Learn more about the menu-file in the wiki. The Systemtray is a little tool of the toolbar that can pick up applications that provide such feature. Applications sit as little icons in the systemtray.